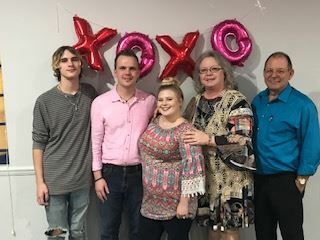 Last month, children in our Albany foster care program received a “dedication of love” from their foster parents at our first annual “Hearts to Love” event, an event created to celebrate the love between foster parents and their foster children. Surrounded by the Inspiritus Southwest community of staff, foster parents and children, each parent stood to present certificates inscribed with their heartfelt messages of love and encouragement to each of the children in their care. Each child also received an “I Love You” teddy bear donated by Build-A-Bear in Albany. “For many of our foster children, in their past they’ve heard the word ‘love,’ but there was no action behind it. I believe they know they are loved by their foster parents, but it means more when a child gets to hear that message from the heart verbally expressed, put it in writing, and presented in front of witnesses. I think it makes it more real for child,” said Carmalete Daniels, Case Manager, Inspiritus, Albany, GA. Though a child’s stay in foster care is temporary, a foster parent and their care and love can have a lasting impact on a child’s life. Both the teddy bear and the certificate are items that the child can keep and treasure as they move onto the next phase of their journey. “It is hoped that our children will keep their ‘I Love You Teddy Bear’, and when they are a little older, will pass on this ceremony by giving their bear to someone in their life they wish to express and dedicate their love to,” said Carmalete. The event and ceremony were so well received by both the parents and the children that Inspiritus Albany plans to make the event a yearly tradition. “I believe the kids felt special. We all want to feel special and feel loved. They felt both on that Saturday,” said Carmalete. *Names have been changed to protect the privacy of our children and their families.